Woodworm are the larvae of the Common Furniture Beetle. They are very destructive and can cause expensive damage if not treated properly. The common way to identify woodworm is from the appearance of small round holes, 2mm across, in wooden surfaces, often accompanied by tiny piles of wood dust beneath them. The holes are made by emerging adult beetles, and the tunnels are made by the grubs inside the wood. The adult Furniture Beetle is a small brown insect 3mm to 6mm long. Rough, unpolished wood are ideal spots for the beetle to lay its eggs. Once hatched, the grubs bore down into the wood where they develop into beetles. Three years or so later, usually between May and September, the tiny beetles emerge from the wood, leaving the distinctive holes. 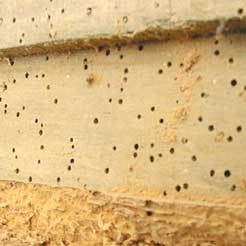 Woodworm is often introduced into houses via second-hand furniture. The beetles themselves can come from anywhere as they fly though open windows. Floor boards and structural timbers such as rafters and joists are ideal nesting sites for the beetle which can cause untold damage. The Death Watch Beetle is another wood-boring beetle, which tends to infest large hardwood beams. There are also Woodboring Weevils which are associated with woods that have wet rot. To treat your woodworm problem quickly and discreetly get in touch. We operate within a 20 mile radius in Redcar & Cleveland including the following towns: Brotton, Guisborough, Marske, Middlesbrough, Redcar, Saltburn, Skelton, Great Ayton, Stokesley, Yarm. As timber treatment specialists we can provide you with a Timber Treatment Survey for your woodworm or dry rot problem.